UVA Arts Board brings The Ruffians to Grounds for workshops and their production of Burning Bluebeard | Department of Drama, U.Va. The Ruffians are an artistic collective of theater makers (clowns, daredevils, acrobats, dancers, writers, performers, designers, directors) who have all honed their craft working over a decade in Chicago’s various and thriving experimental, clown and storefront theater communities. They will present their critically acclaimed production Burning Bluebeard and conduct three workshops on Physical Theatre, Clowning, and Storytelling and Adaptation. Burning Bluebeard by Jay Torrence and directed by Halena Kays will be performing at The University of Virginia’s Ruth Caplin Theatre on Thursday, March 17th at 7pm. Free tickets (limit 2 per person) are available at the UVA Arts Box Office. This fantastical tale inspired by Chicago’s 1903 Iroquois Theatre fire has been an annual Chicago holiday favorite for three years running. Inspired by the true story of Chicago’s 1903 Iroquois Theatre Fire, Burning Bluebeard is the story of six singed clown performers who emerge from the burnt remains of history attempting to perform their spectacular Christmas Pantomime once and for all. But this time, they hope to finally reach the true happy ending of their second act and avoid the fateful fire that killed 600 of its audience members. 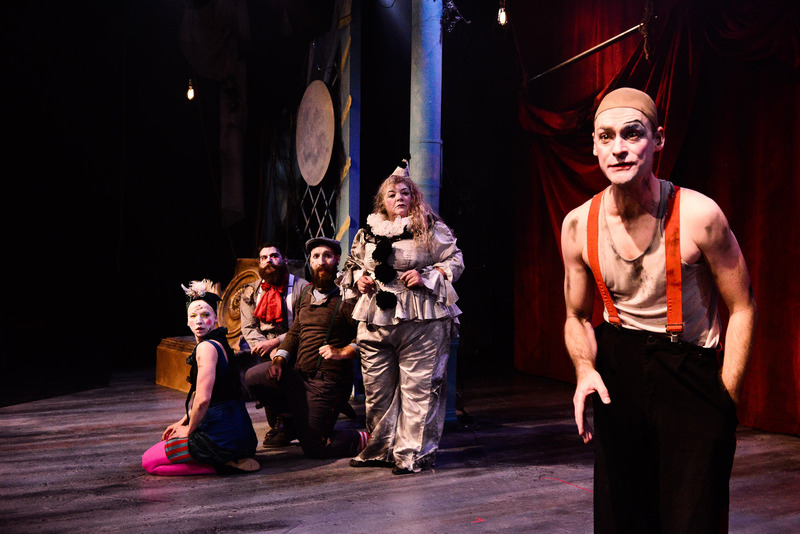 Burning Bluebeard is a whimsical romp with a sensitive heart, a joyful eulogy with a sharp irreverent wit including music, clowning, tumbling, acrobatics and dance. Each performance is a vaudevillian delight with a story that excavates the poetic and poignant remains of a piece of Chicago’s rich history. Burning Bluebeard features this season’s full cast: Pam Chermansky, Anthony Courser, Molly Plunk, Jay Torrence, Leah Urzendowski and Ryan Walters. Information on the workshops being conducted by The Ruffians are below. Please sign up here for the workshops. The Physical Theatre Workshop is today, Monday 3/14 from 6-9pm in Room 115C of the Drama Building. In this workshop, you will begin to understand how to develop an idea into a creative stage picture or performance. Through free-writing, task, and physical object, you will start a working knowledge of putting something “on it’s feet”. Come prepared to move! Clowning Workshop – Friday, 3/18 from 2-5pm in Multi-purpose room 2/3 at the Aquatic Fitness Center (AFC). Storytelling and Adaptation Workshop – Friday, 3/18 from 6-8:45pm in Multi-purpose room 1 at the Slaughter Rec Center. The Arts Board is a cooperative effort between the McIntire Department of Music, the McIntire Department of Art, The Fralin Museum of Art, the Department of Drama, the Vice Provost for the Arts, the Office of the Dean of Students, Student Activities, and the University Programs Council. The Arts Board is composed of twelve students and two faculty members. The student members include six from the presenting department, two students representing the arts from University Programs Council, and four students at-large. The faculty advisors include a representative from the presenting department and an advisor from the Office of the Dean of Students Student Activities. Board), Jacqueline Ford (Co-Chair), Emily Yates (Co-Chair), Joseph Bromfield, Peyton Evans, Mike Giovinco, Roshni Gorur, Abigail Johnson, Rachel Lee, Liz McCauley, Les Rorick, Emily Ross.